There's no other Africa trip like this. And you know it when you're eye-to-eye with a giraffe—from the seat of your bike, on foot or in an open-top 4x4. It's more than you can imagine and everything you expect: premiere lodges, untamed landscapes and once-in-a-lifetime cycling and hiking—all seamlessly connected by our private charter flights. Days 1-2: Exclusive insight into traditional and contemporary culture from our local friends, including one who served on Robben Island with Nelson Mandela Hike along Table Mountain's base to world-renowned Kirstenbosch National Botanical Garden Bike from Cape Point to Chapman's Peak, possibly spotting ostrich, baboons, rare Cape Mountain zebras and elands. Days 3-4: Relax, rejuvenate, walk and mountain bike at Bushmans Kloof Wilderness Reserve and Retreat, where ancient Bushman rock art and red hartebeest antelope embellish the scenery In the mood to taste local vintages, indulge at the spa or go canoeing? It's up to you. Day 5: Private charter flights smoothly connect diverse African landscapes In remote Mashatu, learn to track classic African animals on a guided mountain bike ride teeming with wildlife, including giraffes and the big cats Tonight dinner is served under the African sky around a blazing fire. Days 6-8: Bike in Botswana among elephants on their ancient paths Open-topped Land Rovers make for great game viewing. 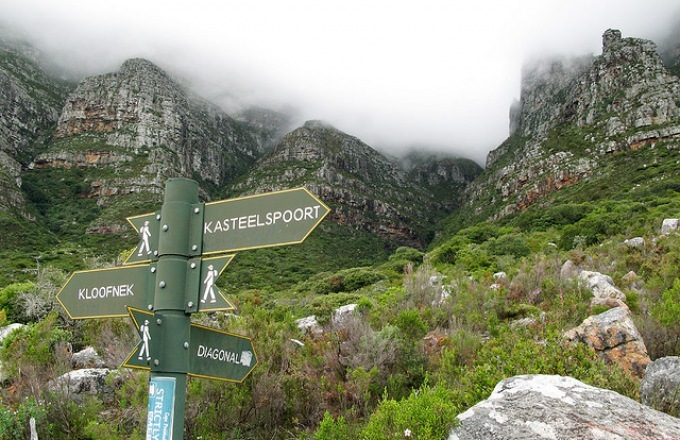 Hike the dramatic but rarely visited Great Escarpment, offering wild views of the bush Browse handicrafts in a charming Afrikaner pioneer town that's home to a thriving artist community. Days 9-11: Spot the Big Five and other fascinating creatures like dung beetles and lilac-breasted rollers at Londolozi during exhilarating bush excursions on foot and in "Landies" Join our friend Lotus in his traditional Shangaan village.